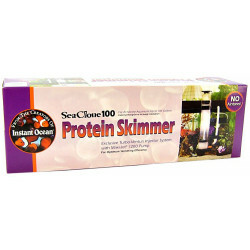 Protein Skimmers and Saltwater Aquariums go hand in hand. Aquarium Skimmers are one of the most important pieces of equipment you can use to maintain excellent water quality in your aquarium. Reef Skimmers remove contaminants from your aquarium's water before they get a chance to break down into dangerous elements, while also removing toxins that are released from coral and fish. 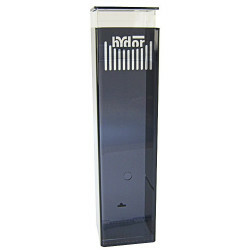 The best way to choose the Aquarium Skimmer that is right for you is to use our search by aquarium size. 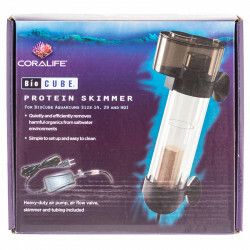 Browse through all of our protein skimmers to find the perfect skimmer for your saltwater aquarium. Pet Mountain's Aquarium Skimmer store features top quality skimmers from the most trusted names in the aquarium care industry, including Oceanic, Coralife, Rio, Lee's, Instant Ocean, Bubble-magus and more. The Oceanic BioCube Protein Skimmer is used to quietly and effectively remove any harmful and unwanted organics from saltwater tanks. 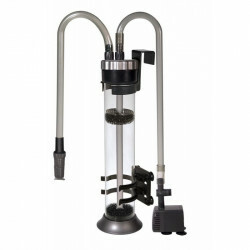 This protein skimmer comes equipped with a heavy duty air pump, air flow valve, protein skimmer and tubing. 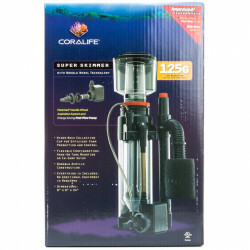 The Coralife Super Skimmer with Needle Wheel Technology can be used in sump or with a hang-on mounting bracket. This skimmer features a wide neck collection cup with easy twist feature for effortless cleaning. The duel injection inlets also increase bubble/water contact time and the bubble production diffuser prevents the flow of micro-bubbles into the main aquarium. The Rio Nano Skimmer hang-on filter features simple installation and a compact design. This skimmer includes intake venturi and needle wheel, and adjustable variable venturi with exclusive air/water mixing chamber.